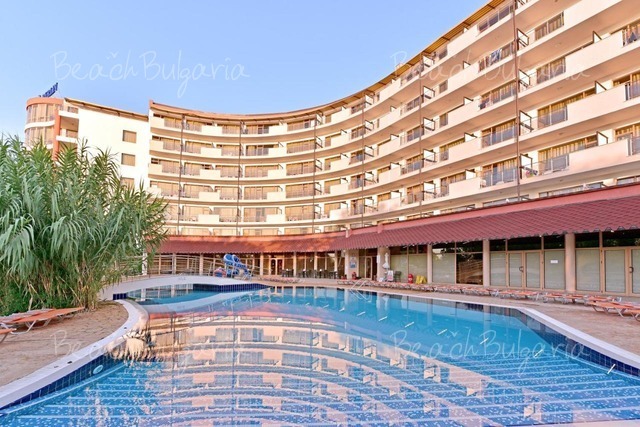 Sunset Resort is situated on the South Beach in the town of Pomorie, at 15 minutes driving distance from Burgas international airport and 25 minutes from Sunny Beach and Nessebar resorts. There is 400 m long beach right in front of the complex. Sunset resort consists of 5 aparthotels and 6 luxurious boulevard villas with total built up area of 115 000 sq. m.There are 771 units in the whole resort from studios, one, two and three bedroom suites to presidential suites with sizes from 59 sq. m to 135 sq. m.
The guestrooms include telephone, safe deposit box, satellite/cable TV, fridge, cooking facilities, tea/coffee making facilities, hair-drier, bath, balcony. 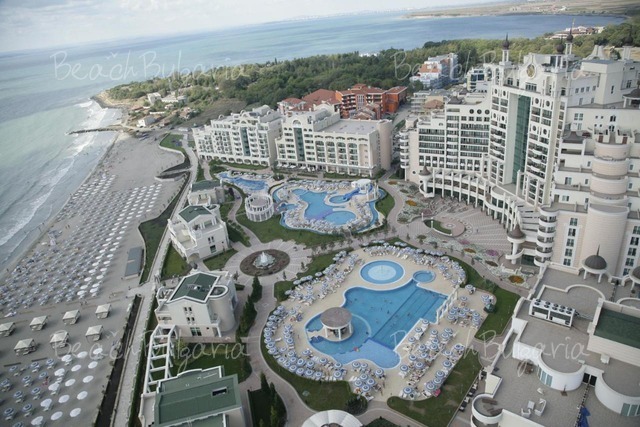 The hotels offer splendid sea views from most of the suites, another suites offer views to the Stara Planina Mountain. Sunset Resort offers variety of bars and restaurants. There are 9 restaurants (5 main buffet restaurants, and 4 a la carte restaurants), several lobby bars, 2 pool bars, Vienna pastry shop, a Vitamin bar and a boulevard seafront Sunset Cafe. 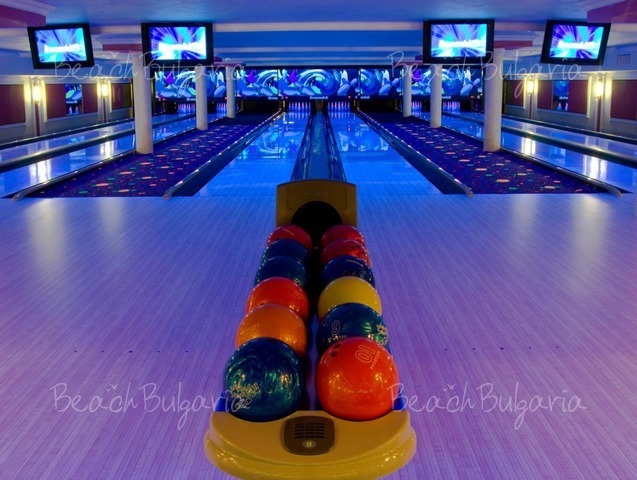 At guests' disposal are bowling and billiards evening bar. Sunset Resort's Spa & Wellness oasis is situated in aparthotel Sigma on a total build up area of 1000 sq.m. The Spa & Wellness center comprises two major sections - a wellness & massage section and a thermal section. Beauty salon, hair dresser, manicure, pedicure, Solarium room, Tangentor bath tub with underwater massage, Hammam, massage showers, Massage water bed, massages, Ayurveda, hot stone therapy room, etc. Thalasso sauna, Laconium sauna (60 °C), Finnish sauna, Herbal sauna, Infrared sauna, Steam bath, Massage showers, Ice fountain, Kneipp-Basin, Relaxation area with heated stone loungers, bamboo couches. 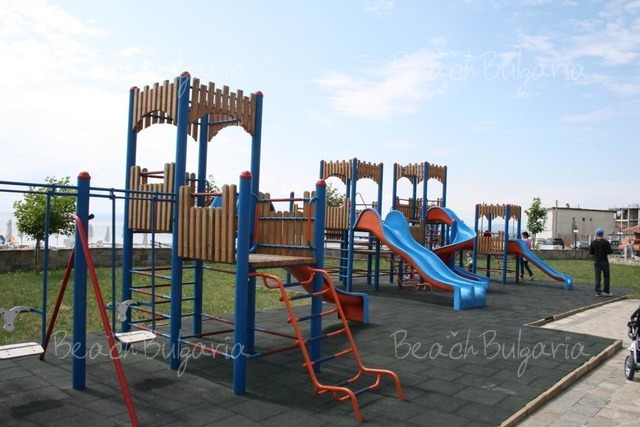 The complex offers 4 outdoor swimming pools with children’s sections and water attractions. Sigma Aparthotel offers an indoor swimming pool of a semi-Olympic size, 25 m long, children’s swimming pool with water slide and Jacuzzi. The conference hall with 500 seating capacity offers 2 fixed and 2 movable screens, wireless and head set microphones, multimedia, flip chart, overhead projector, notebook, stage, etc. 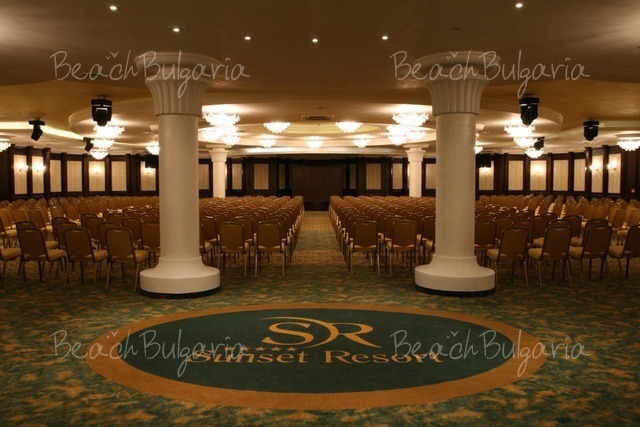 Money exchange, elevator, safety deposit boxes, laundry, dry cleaning, business centre, internet access, simultaneous interpretation facilities, children playground, shops and boutiques, outdoor parking lot, hair and beauty salon, restaurant, photocopy and fax services, cafe, bar, night club, lobby bar, pool bar. * All prices in Euro, per apartment, per night, breakfast included. Guests of the hotel can use swimming pool, sunbed and parasol near the pool for free. * Cancellations can be made free of charge providing details of this are received at least 17 days prior to check-in time on the day of arrival and 21 days during 06 July - 23 August - cancellations made after this period will incur a fee equivalent to the cost of 100% of the accommodation. Please, post a comment on Sunset Resort.